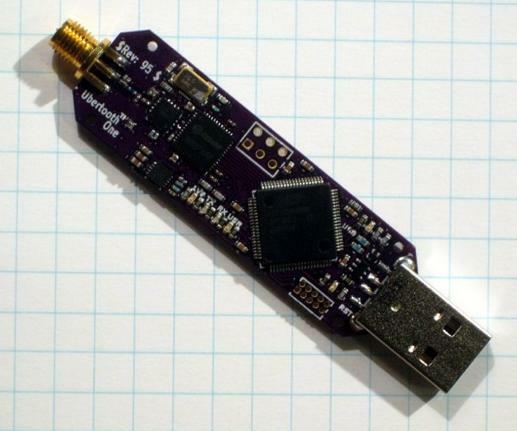 Ubertooth One is a cheap, open-source Bluetooth network sniffer. Unlike Wi-Fi, which has had a wide range of free network monitoring tools for years, Bluetooth has remained pretty closed. Michael Ossman is about to change this, with his Ubertooth Kickstarter project. The Ubertooth One is a USB plug with an antenna, and a ARM Cortex-M3 processor-based board in-between. Plug it into your computer and you can use it with various wireless monitoring tools like Kismet. The Ubertooth allows you to use Bluetooth in monitoring mode. This “promiscuous” mode makes the radio pass everything that it picks up onto the host computer. Normally, wireless receivers will ignore anything not addressed to them. In promiscuous mode, you can sniff and gather data meant for other devices. These tools can be used for testing network security, or for hacking. Kismet, for example (and derivatives like the Mac OS X version KisMac) can be used to crack Wi-Fi networks’ passwords. Until now, Bluetooth monitoring hardware would cost upward of $1,000. Ossman’s device will cost just $100 and, because both the software and hardware are open-source, you can build your own. Ossman demonstrated the Ubertooth One at the ShmooCon hackers convention on Friday. Future software updates will enable Bluetooth injection and expanded monitoring modes. WinDump is the Windows version of tcpdump, the command line network analyzer for UNIX. WinDump is fully compatible with tcpdump and can be used to watch, diagnose and save to disk network traffic according to various complex rules. It can run under Windows 95, 98, ME, NT, 2000, XP, 2003 and Vista. WinDump captures using the WinPcap library and drivers, which are freely downloadable from the WinPcap.org website. WinDump supports 802.11b/g wireless capture and troubleshooting through the CACE Technologies AirPcap adapter. SniffPass is small freeware utility that listens to your network, capture the passwords that pass through your network adapter, and display them on the screen instantly. SniffPass can capture the passwords of the following Protocols: POP3, IMAP4, SMTP, FTP, and HTTP (basic authentication passwords). what it does that it sniff the yahoo messenger packets in your network and you may be able to see all the messeges coming to a particular ip address in your network.